Years ago the problem was to find the movie needed - now the problem sounds a bit different: how to cope with huge collections we've been gathering for years already. Movie buffs' collections include not even hundreds, but thousands of items actually: Can you imagine how capacious your memory should be to manage properly such a number of films? But, as is often the case, the cause of the problem (fast-moving information technologies development) helps to find the solution. 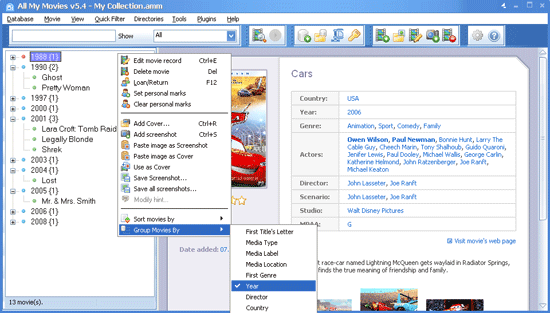 Nowadays there is movie organizer software which is capable of making your collection just perfect. So, would you like to have a clear and presentable overview of your collection? Then let me introduce All My Movies - it knows the answers to all your questions and helps you to orient yourself better in the moviedom. Let's consider work with the program in detail. At the first launch there appears the window which contains brief information concerning how to buy the license and one more piece of advice, which will further help you not to lose the movie database created. The thing is that you shouldn't use sample.amm database delivered with the program for your own movies, because this file will be rewritten every time the program will be updated or reinstalled. That means that sample.amm is only meant for familiarization with the program and its functionality before buying the license. A new database can be created only in a licensed version. All minor updates are free for registered users. 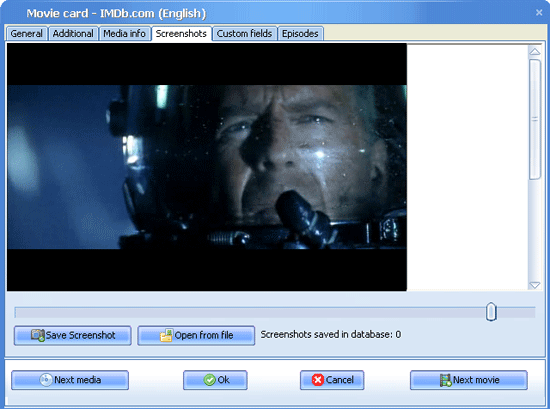 All My Movies having been launched, it displays the "Tip of the Day" window and opens the sample database which includes several movies. If the "tips of the day" get on your nerves, there is an option not to show them in the future. The program's interface gladdens the eye and is available in more than ten languages - so, if your English is not perfect, you may use your native language. So, let's start with adding a new movie into your All My Movies collection. There is no typing needed here, except just entering the name of the movie - all the other information about the film is picked up automatically. Well, let's stop "riding before the hounds" : and consider everything step-by-step. The program starts searching the movie in the online database chosen. In the movie card there is a small button next to the "Original title" field, which allows choosing the online database, in which the search of the movie is going to be performed. For each language several online databases are available. Besides, there are plug-ins for other popular databases. 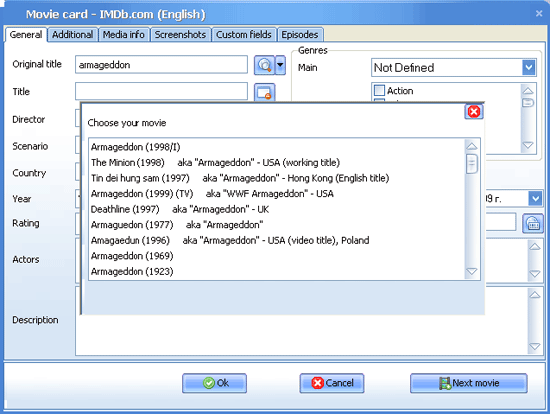 So, let's try to find the movie "Armageddon" in the largest online database IMDb.com. Type the word "Armageddon" in the field "Original Title". The program finds several movies and offers to make the choice needed. Double click on the movie needed and several seconds later full information about the movie is found and all the fields of the movie card are filled in. Press "Ok"! As it was mentioned above, there are other ways to add a movie to the database as well. Thus, you can also add a movie from a file by choosing "Movie - Add from File...", the program offers to specify the directory and adds the movie. The program picks up technical information from the file like duration, file size, resolution, aspect ratio, data about audio - and video streams codec info, frame frequency etc. This way of adding movies allows making certain stills from the video file and saving them in the movie card! You are welcome to add any stills from the movie you like best of all. This option seems to be extremely useful, because it's sometimes really hard to remember what a movie is about, but having a quick look at some stills, you remember everything in a twinkling of an eye. The next screenshot displays it. By moving the scroll box, we find the most representable still, press the button "Save Screenshot" and it is immediately added to the movie card. You're welcome to make as many stills as you like. This way has one more advantage - the movies added in this way can be run right from the All My Movies, there's a special "Play" button for this at the top of the window. Menu item "Movie - Add DVD" works in a similar way, being meant for adding DVD discs, not separate files. This way also presupposes the option of adding your own screenshots and picking up technical information from DVD. And the last way to add movies into the collection is by using menu item "Movie - Add DVD by Bar Code...". In this case the program searches movies in online databases not by title, but by bar code. Those users possessing bar code scanners can use them. All My Movies supports the majority of widely-spread models. So, enter the bar code and the information about the movie is available. Very easy and fast! Now that all the movies needed are added to your database, let's study the abilities of the program. The window of the program can be visually divided into two parts: the left part is the entire list of movie titles in the collection and the right part is the movie card giving the brief presentation of the movie selected in the Title list. Let's consider both parts in detail. Title list of your collection in All My Movies can be modified to your liking. You may add some more columns there, for example, year of release. You can do that in the menu "Tools - Preferences" - "Display Area" tab - Additional Columns. Just tick the needed columns and they will appear in the title list. Starting with 5.4 version, All My Movies has a virtual shelf collection view mode. You can switch view mode - Title List, Thumbnails, Virtual Shelf - in the "View" menu. You can read more detailed description of Virtual Shelf mode. Some types of filtering and sorting are available directly from a movie card. 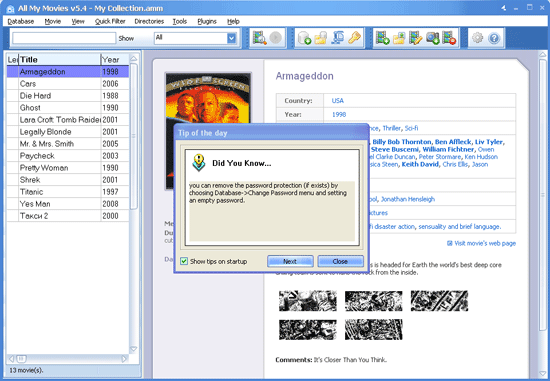 Thus, if you left-click on the name of an actor, the program offers to show all movies with this actor or find the additional information about him. Having selected any genre in the movie card, you may either group movies by genre, or show only movies of the genre selected. If you are a real movie lover, then you will probably want to learn some additional information about actors, directors, writers. All My Movies automatically finds all possible information in seconds and stores it in the database, including actors' photos, biography and filmography. Pop-up photos of actors and brief information about them appearing when you point to his/her name with the mouse. The option is active only when the actor's card is filled in. Now coming back to the movie card templates. The program has got several possible types of HTML templates - you are sure to find one which suits you best of all. You can switch between HTML templates available in the menu "View-HTML Template". Besides, in the program there are various modes of export your movie database to one of the formats: HTML, CHM, Plaintext, Microsoft Excel, PDF, and even to your mobile phone. So, you will be able to place your collection of movies at your site or just print the cards with the movie information needed. There are also opportunities for import of your databases from Microsoft Excel or text. All these options are available from "Tools" menu. All My Movies has also got a smart loan manager which allows not to forget whom you give this or that movie and when it's going to be back. The program reminds you of the movies loaned and keeps the history of movies taken and returned for each friend. It's extremely easy to work with this option. When you give a movie to one of your friends, find it in the database, then choose "Movie - Loan/Return" or press F12. There appears the following window. In the window you should enter the friend's name and set the number of days, on expiration of which the program reminds you to take the movies back. When you press "OK", the program marks the movie as lent. When the movie is returned, you should simply use the same menu item and mark this movie as returned. It's very convenient and highly useful. As a conclusion, it is necessary to note that All My Movies is really one of those flexible and tunable instruments in the hands of a movie fan, which can masterly organize and harmonize any movie collection, no matter how large it is, right to user's liking and in accordance with his/her needs. Download the trial version of the program from the program's official site and see it for yourself.